JC Cutler and Nathaniel Fuller are beloved by audiences who have seen them at major local theaters over the years. They’ve both actually played Scrooge in the Guthrie’s perennial smash hit, A Christmas Carol. So maybe it’s good karma that they are playing the two primary roles in what has been one of the longest running plays in London (theater capitol of the world) history, The Woman in Black. Stephen Mallatratt’s stage adaptation from Susan Hill’s book makes it paramount that the spoken word is expressed with nuance and depth of understanding. At Osseo’s Yellow Tree Theatre this necessity is exquisitely realized by the actors via Jon Cranney’s wise and subtle direction. The story involves the estate of a deceased woman who lived in an English village. The woman’s ghost actually enters at points throughout and makes for some downright scary moments. 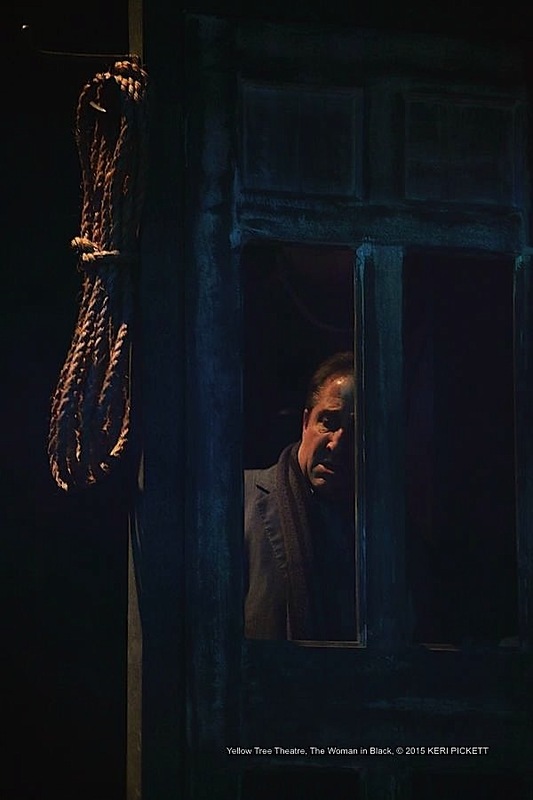 Arthur Kipps (Fuller) has been traumatized by events leading up to and surrounding this woman’s death, so he hires an actor (Cutler) to draw the story out of him. The two men re-enact events, some of them quite unsettling, channeled into the actions they play on stage. Kipps, who is utterly inarticulate in the opening scene, becomes the voice of various persons involved in the life of this woman in black. Fuller is brilliantly versatile as he masters numerous transitions between his many characters. Cutler brings forth and inner steeliness which contrasts Fuller’s mercurial sensibility beautifully. Both actors use spoken vocal range and delicate modulation to bring the storytelling to visceral life. The setting is a Victorian theater’s storage space. 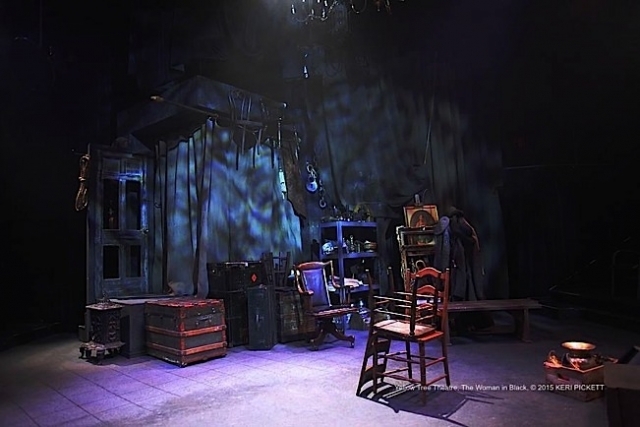 The eerie atmosphere is sumptuously enhanced by Robin McIntyre’s set design decorated with old set pieces, images, and striking use of fabric. 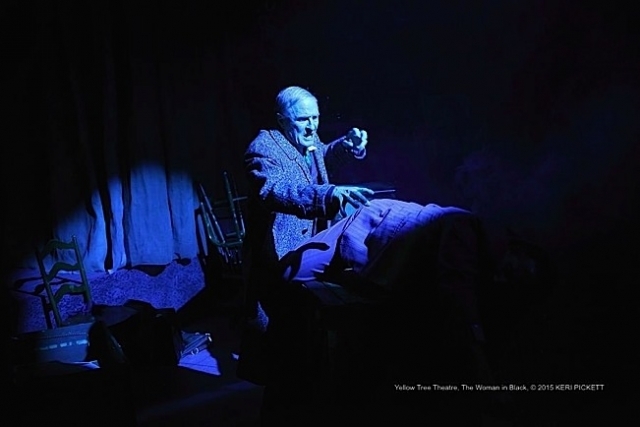 Sue Ellen Berger’s macabre lighting and Montana Johnson’s soundscape have a ghostly rhythm all their own that seems to sweep the actors and the audience into a supernatural realm. It all works ingeniously. Seldom does such simplicity render such darkly majestic results.